October | 2013 | Love Those "Hands at Home"
I did one of my least favorite preparing-the-garden-for-winter chores this week. 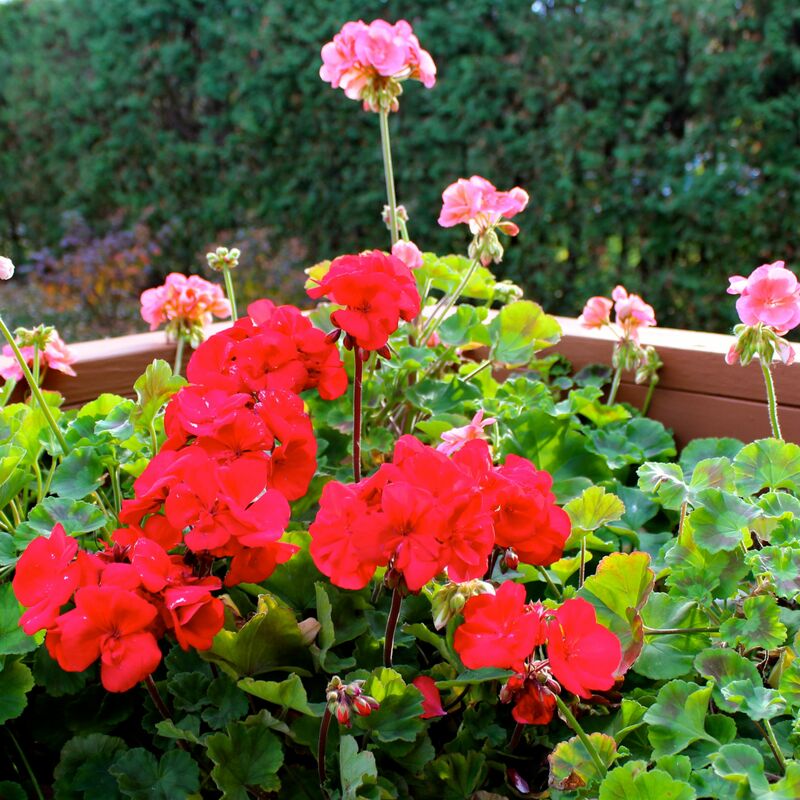 I cut back my geraniums and put them in the dark for the next 6 months. The whole process of putting gardens to bed in the fall makes me sad. All those beautiful annuals, which gave so much all summer, go to the compost pile. The perennials, some still doing their best to produce flowers, get cut way back. I’m not going to tell you how I talk to the plants as I cut them back and consign them to compost. It’s a little embarrassing. But it does make me feel better, to reassure them that they were wonderful. The geraniums, for me, are the most difficult. They still look so completely fabulous, in the traditional red and this crazy-pretty salmon color. The only thing that makes me feel better is that, with a little luck, some of these plants will survive the winter and be back, better than ever, next summer. 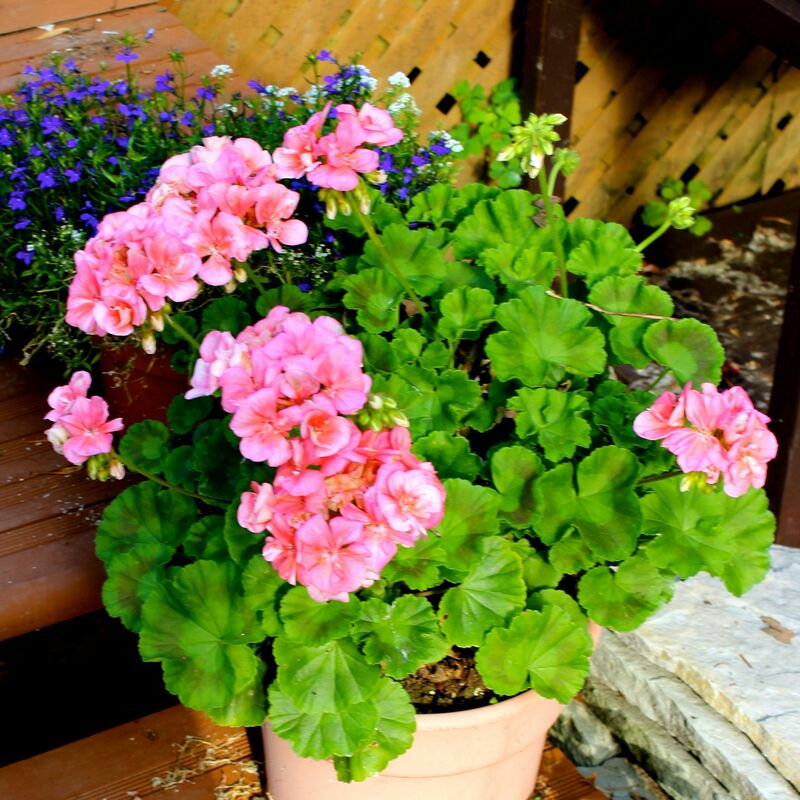 Most people who really garden know that geraniums can be over-wintered. 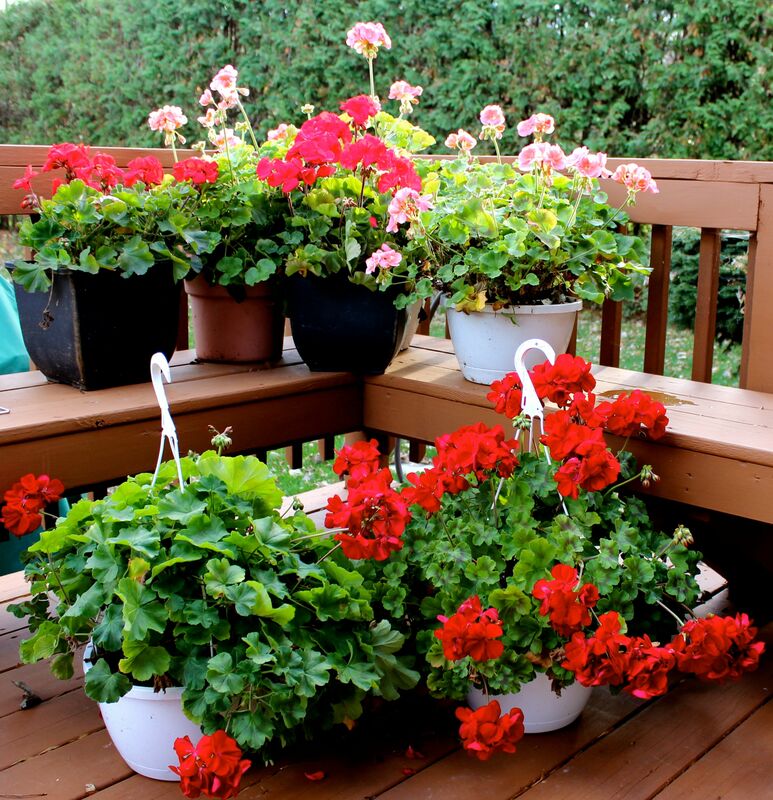 When we lived in a house with a proper basement, I could count on the geraniums every year. I would just cut them back, including getting all the blooms off, and put them in the basement. It was cool in the basement, but not cold, and they got a little light, but not much. I could throw water on them if I thought they were excessively dry but, mostly, I just said “Hi” when I went down to do laundry. When spring started to come around, I’d start watering and give them more light, and all would be groovy. But now I live in a house with only a completely lightless crawlspace beneath. It stays pretty warm, it stays pretty damp-ish, and it’s 100% pitch black. We don’t really go down there at all, all winter. I sure wouldn’t want to spend 6 hours down there, let alone 6 months! When we first moved here and I realized I had no place to properly over-winter the geraniums, I decided I’d just stick them in the crawlspace and see what happened. I figured they would die but they were going to die anyway, if I left them outside. I was sad, of course, especially about the salmon ones because I’d had them for a few years at that point; we were old friends. 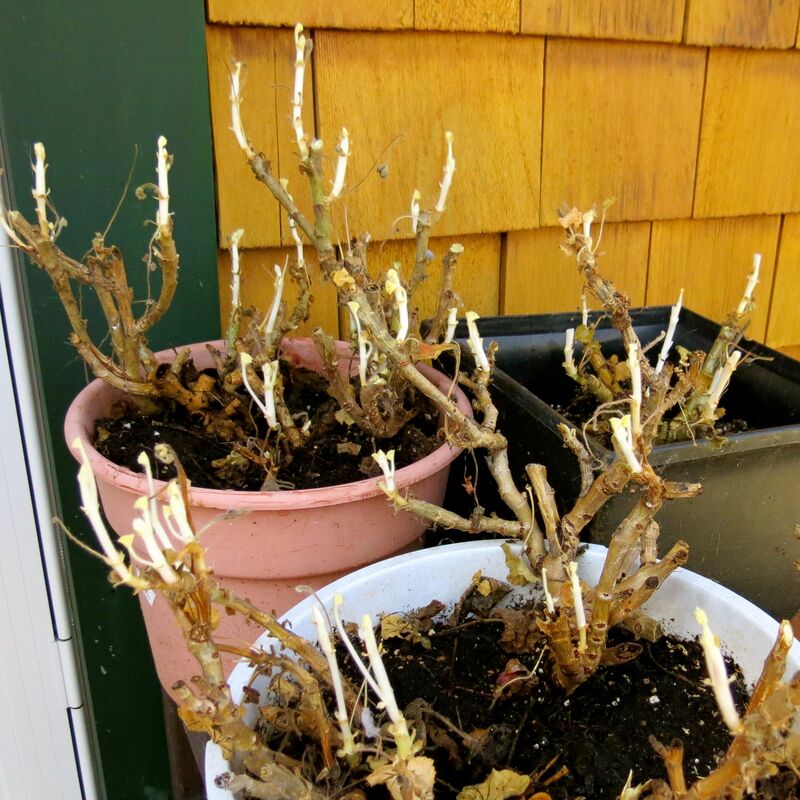 When the plants came out of the crawlspace that first May, it was a kind of horrifying sight. 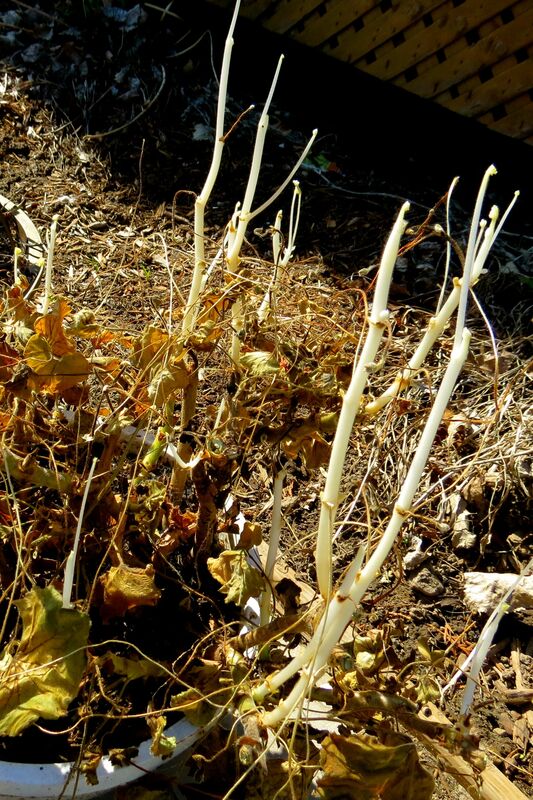 They were alive but looked undead, kind of the albino-vampire-zombie version of geraniums. The stems were completely white and spindly, very leggy, like they were desperately trying to find some light, any light. I couldn’t imagine these pale pretenders ever looking alive again. But we’d come this far together so I cut off the dead stuff and the really spindly stuff, I watered them and I put them in a warm, sunny spot. And, slowly, the most amazing thing happened. 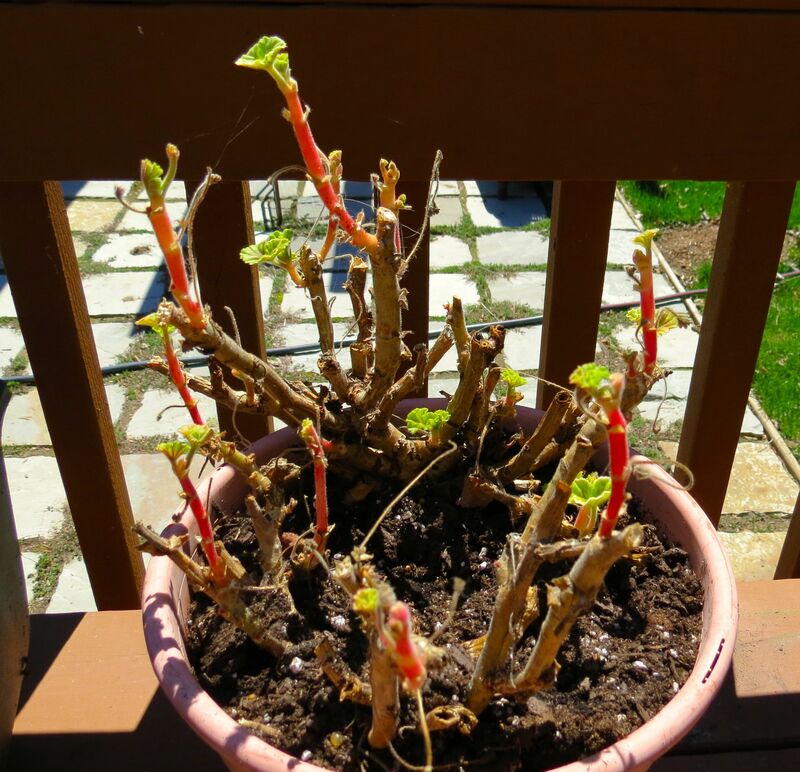 The stalks became hot pink and little green leaves sprouted. Then, they became gorgeous again. I guess it’s not really all that amazing. We probably all have a story about nature bouncing back against all odds. 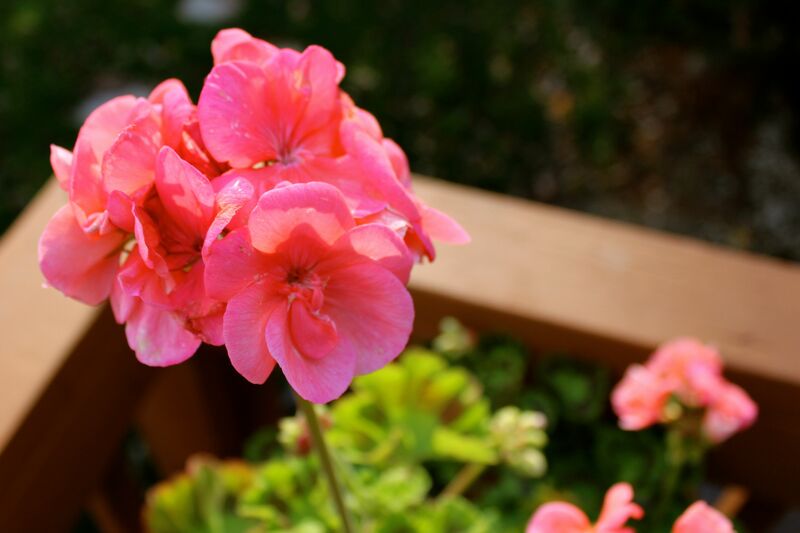 But these geraniums, and their will to flourish, sort of symbolize what spring is all about to me. So, in the fall, as I put the geraniums into their lightless prison, I think about spring. And I think about my own winter, hunkered down in my warm, cozy house, with the geraniums sleeping beneath me. I think about how we’ll all keep a low profile for the winter and reappear come spring, very pale, craving the sun, but ready to thrive! A huge space, filled with of handmade quilts, on a brisk autumn day! When the biennial show of the Champlain Valley Quilters’ Guild of New York opened a couple of weeks ago, the colors inside the building rivaled those on the sugar maples outside. But the colors on the quilts will last long after the leaves have fallen! I’ve said elsewhere that I think quilting is, just maybe, the quintessential expression of “loving hands at home.” It conjures images of regular people, using what they have on hand, to create a practical item that transcends the maker and the purpose. The time commitment in making a quilt is not undertaken lightly and the finished quilt envelops and warms the recipient, and brings beauty to any space. To see nearly 300 quilts and other textile projects on display is to see thousands of hours of work and love made tangible. 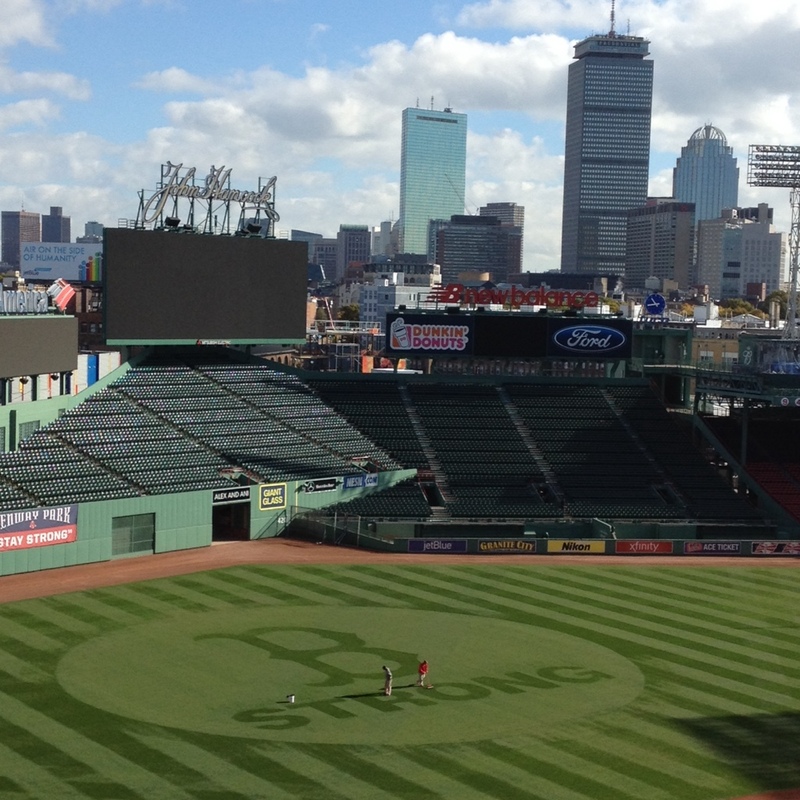 The photos sort of speak for themselves. Like every quilt show, this one was pure eye candy. Many of the quilters had participated in a “mystery quilt” challenge, in which they were instructed to choose fabrics along certain guidelines and then follow instructions that were communicated periodically, so the beauty of each woman’s quilt (and, yes, they were all women—no men in this guild at all!) would be revealed slowly. These quilts were displayed together and the range of colors choices was fascinating! Probably every quilt show has a regional angle or flavor. This one was no different. These quilters are based in the Adirondacks and Lake Champlain region of upstate New York so many of the quilt reflected the colors and subject matter of the area. I am pretty bummed to say that I did not win the raffle quilt but I did pick up a copy of the Quilters’ Guild cookbook, which they compiled a few years ago. I love these community-based cookbooks for their old-fashioned, and often downright quirky, recipes. This recipe book reflects the region just as the quilts themselves did. It has far more recipes for desserts and sweets than anything else, with an emphasis on apples and maple syrup, of course! Drink plenty of water. Eat breakfast like a king, lunch like a prince, and dinner like a beggar. Large meals earlier in the day are healthier for you. Eat more foods that grow as plants and eat less food that is manufactured in plants. Live with the 3 Es: energy, enthusiasm, and empathy. Read more books this year than you did last year. Take a 10-30 minute walk daily and, while you walk, smile. Realize no one is in charge of your happiness except you. Call your friends and family often. Each day, give something good to others and get rid of anything that isn’t useful, beautiful, or joyful. Life Lessons from Linens: A Blog Series to Visit! Hey, lovers of “hands at home,” all things vintage, and especially vintage linens! I want to direct you to a fun and interesting blog series that I think you’ll like. Susan Nowell, the blogger behind My Place to Yours, has been doing a series this month called, “Life Lessons from Linens.” As she says, “This is a series of 31 posts dedicated to life lessons I’ve learned (or been reminded of) while working with vintage linens.” The lessons range from “We learn about Life when we look beyond ourselves” to “Look for the beauty in every season of life” to “’Imperfect’ is okay”. Check it out if you have the chance—the posts are very readable and include beautiful images of all kinds of vintage linens! I know the light changes in autumn; I can’t explain the whys and wherefores, but sunsets seem more glorious, too. The first of these photos was taken on October 10, 2013, at 5:28, and the last was taken at 6:40 the same evening. Other than slight cropping and straightening, so the horizon was actually horizontal, I didn’t edit them. Have you taken a walk, in an area you thought was purely natural and untouched, only to find evidence of previous habitation? Where humans go, we leave our imprint. Very often that’s an unpleasant sight—candy wrappers or cigarette butts in an otherwise pristine landscape. But sometimes we come across a sign that humans lived here and sought to beautify their world. If you find day lilies, a lilac bush, or an apple tree in a field, it’s a good sign that people once lived on that spot and tried to make it their own. 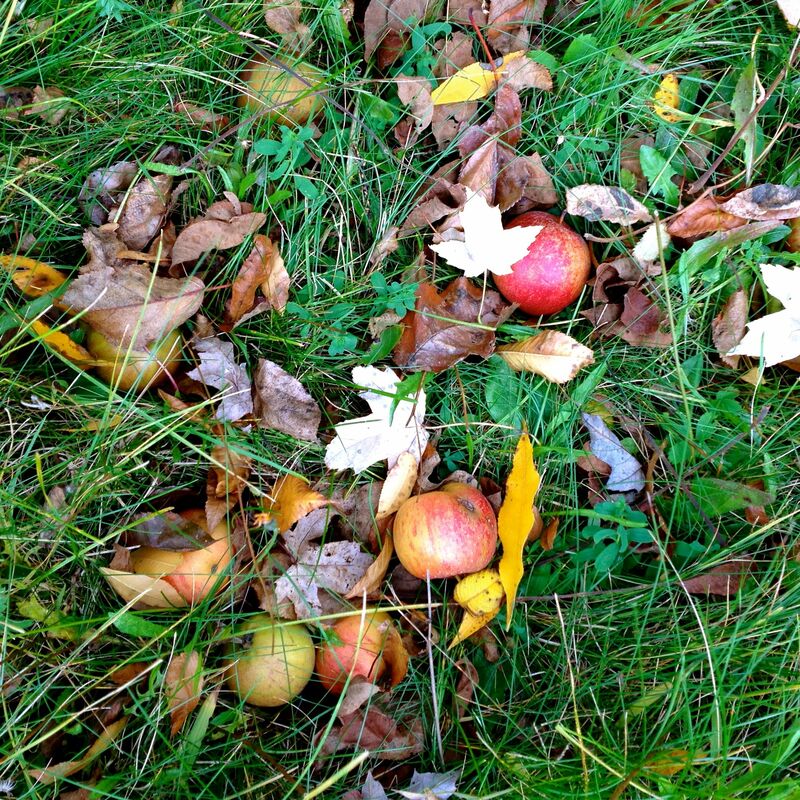 As I take walks in my rural setting, I love finding an old apple tree, heavy with fruit and surrounded by deadfall. I know it means that, at some point, someone planted that tree and encouraged it along, and the tree is still providing as best it can. Some people hate the sight of deadfall. They see it as sad, because the people are gone and the tree is producing for no one. Or they see it as wasteful. I read a blog a couple of months ago, in which the author wrote, fairly indignantly, about how awful it was that fruit was allowed to sit on the ground and rot when it could feed hungry people. But I don’t see deadfall as sad or wasteful. The tree is doing what it was designed to do and, even though the humans who planted it are gone, the fruit is feeding innumerable birds and animals, as well as re-feeding the very ground in which the tree grows. And it provides an unanticipated sense of community to any person who happens by, and recognizes the human hand behind the tree’s existence on that spot. I love the poem “Unharvested” by Robert Frost. I don’t know if I love it because it expresses my feelings about these old trees or if my feelings about the trees derive from the poem. 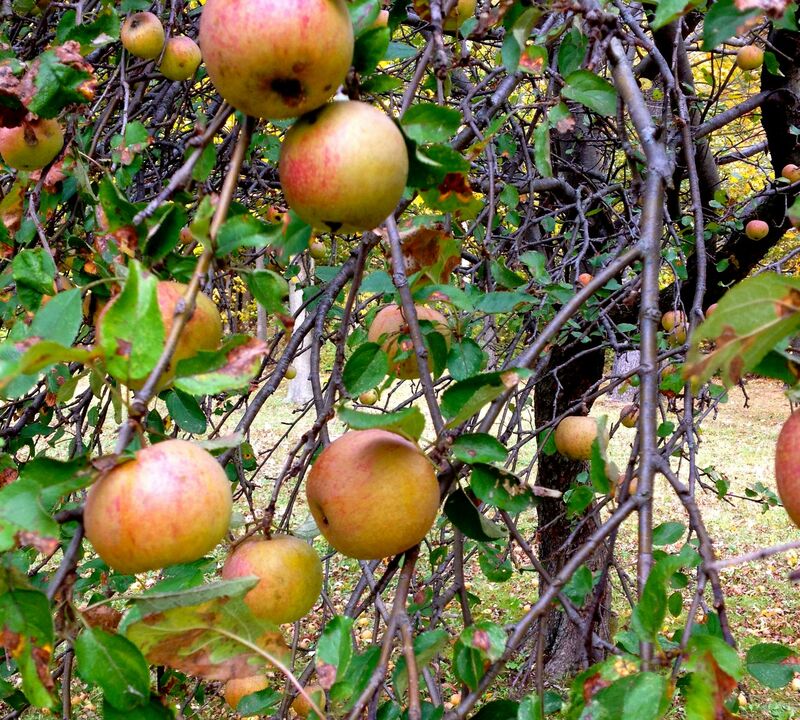 It’s not as well known as his other poem about apples, “After Apple Picking,” but it is a much more hopeful poem. As humans, we plant and we harvest. We monitor the seasons and try to account for every little thing. We become difficult to surprise or delight. The discovery of an unexpected deadfall, the sweetness in the air and the color on the ground, becomes our reminder that nature still has the ability to outwit us and surprise us, and to outlast us. So, should we see it as deadfall, and a waste, or a lively, and uplifting, lesson about being open to the unplanned and nature’s ability to catch us off guard?